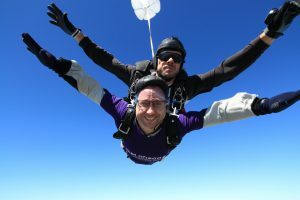 On Saturday 30th June five daredevil fundraisers plummeted 13,000ft to raise funds for Get A-Head, and have to date raised over £3,000 between them. 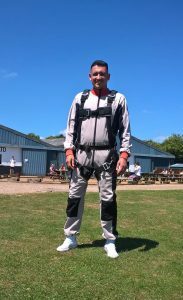 The 5 Skydiving fundraisers included a team of three Unilever employees, raising money in memory of their colleague Mel Jaggard, who died from a rare form of neck cancer, Adenoid Cystic Carcinoma, in 2013. Ryan, Mel Jaggard’s brother, joined us for his first skydive and said: “For my first ever skydive I could not have asked for a better experience. 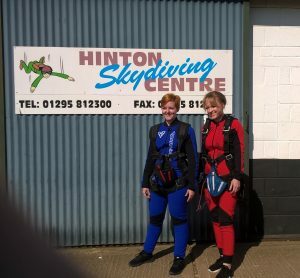 The weather on the day was glorious and the folks at Hinton Skydiving Centre did a fantastic job looking after us. I will never forget the words of my son Maks before I went up for my jump …. ‘Daddy, please don’t go splat!’ – luckily I didn’t! Katherine Carter, from Unilever, was taking part in her third skydive for Get A-Head and said : “Get A -Head skydiving is utterly fabulous. Where else can you spend a Saturday jumping out of a perfectly serviceable plane, fly like a bird and then float to the ground with the biggest grin on your face itching to do it all over again. Not only that, you know you’ve raised money for such a great cause too. It’s a win for everyone. Sign up you’ll never regret it”. Other skydivers included Pippa Riley and Katie Knight, who also worked at Unilever and Andy Autie , who is friends with members of our Friends of Get A-Head Group. Charity Administrator, Anne-Marie Patrick, said: “The day was a huge success, raising a fantastic £3,000 to continue supporting patients and their families suffering from head and neck diseases, including cancer, through the funding of research, education and the purchase of vital equipment.